Bellows Lite and Bellows Pro share a common codebase, but are two independent plugins. You will only have one activated at a time. When you purchase Bellows Pro, you’ll receive a zip file to download. Follow the Installation Instructions to install the Bellows Pro plugin. If you currently have Bellows Lite active, the Bellows Pro installation process will attempt to disable Bellows Lite. 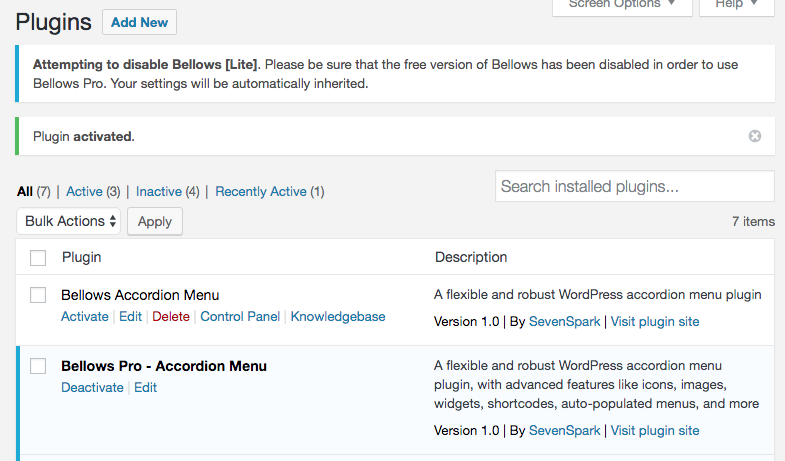 Double check that the Bellows Accordion Menu plugin is disabled and only Bellows Pro – Accordion Menu is enabled. Leaving both active may cause errors. Bellows Pro adds Menu Item Settings, Customizer style settings, Autopopulation capabilities, the Menu Code Generator UI, and more!